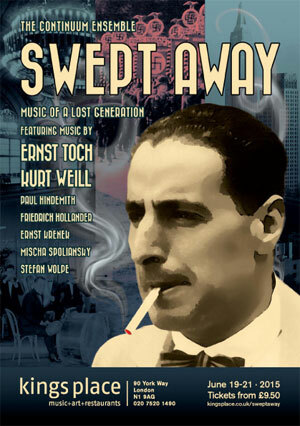 Swept Away comprised music by German and Austrian composers who fled into exile in the early 1930s. Persecuted and threatened with arrest for their Jewish origins, socialist political views and artistic ‘modernism’, the composers’ music was banned from performance and publication so their work almost completely disappeared until recently. The festival brought this unjustly neglected music back into the light and revealed its outstanding quality and engaging modernity over five concert programmes, pre-concert talks and readings at Kings Place concert hall, London, June 19 - 21, 2015. Featured were Ernst Toch, hailed as the most promising young German/Austrian composer in the 1920s, Kurt Weill, relatively unknown but writing music for theatre and radio, Paul Hindemith, Erwin Schulhoff, Stefan Wolpe, Ernst Krenek and cabaret composers Mischa Spoliansky, Friedrich Hollander, Wilhelm Grosz and Herbert Zipper. Programmes featured opera, chamber, choral and orchestral music as well as cabaret-theatre songs; eleven pieces were performed in the U.K. for the very first time. Outstanding soloists included sopranos Sarah Tynan, Anna Dennis, Donna Bateman, mezzo sopranos Lucy Schaufer and Martha Jones, tenor Andrew Rees, bass Barnaby Rea, cellist Joseph Spooner, violinist Hugo Ticciati and flautist Lisa Nelsen as well as Douglas Finch, piano and Philip Headlam, conductor, co-artistic directors of The Continuum Ensemble. The BBC Singers, U.K.’s most renowned choir performed and featured in broadcast on BBC Radio 3. Lawrence Weschler, grandson of Ernst Toch, spoke about Toch’s life in Germany and exile in the U.S.
Festival patrons were conductors James Conlon and Lawrence Foster and author Daniel Snowman. Funding by: Dunard Fund, Golsoncott Foundation, Radcliffe Trust, Kurt Weill Foundation, Wigoder Family Foundation,Harold Hyam Wingate Foundation and Arts Council England. (two performances scheduled for July 7 were cancelled due to the London Underground attacks, a second performance was re scheduled for July 10). 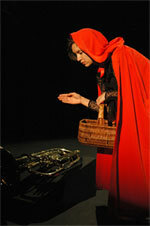 Aperghis’ treatment of Little Red Riding Hood. Charles Perrault, elected to the Académie Française in 1671, published eight folk tales in 1697 entitled Contes de ma mère l'Oye (Tales from Mother Goose.) Generally regarded as the first such collection, these were literary adaptations of stories from the ‘folk’ population for the more educated classes. Immediately very successful, the Contes were translated into English by Robert Samber in 1729 and reworked by the Grimm Brothers in Germany a century later, which in turn were translated into English and made widely available. Perrault's original Le Petit Chaperon Rouge is considerably darker in tone than the later and more familiar version known in English with regard to the characters and their actions. Most notable is the absence of a 'happy ending' or redemptive conclusion. An important element was the concluding 'moralite': rhyming admonitions for instilling good behaviour in children readers. The tale has been reworked countless times in many forms such as novels, poems, stage works, short stories, illustrated books, songs, cartoons and films. Angela Carter’s retelling in The Company of Wolves is well known in recent times along with the Tex Avery cartoon version and Stephen Sondheim’s musical Into the Woods. It has been analysed extensively in our Freudian age as a key to various subconscious desires and patterns of behaviour. Aperghis has set the tale for six instrumentalists who tell the story through speaking, intoning and playing The narrative is presented in repeating cycles, akin to Harrison Birtwistle and Tony Harrison’s 1977 folk tale reworking Bow Down. The music draws on dance and comic cartoon music in strongly energetic motion and exuberance and contains virtuosic instrumental figuration. Aperghis also employs extensive use of microtones (the notes ‘between’ the white and black keys of the piano, playable only on string and wind instruments) to create a landscape of psychological unease and fracture. I first encountered Georges Aperghis’ musical dramatic works when I was working for the Contemporary Opera programme at the Banff Centre Canada; Keith Turnbull was the visionary programme director at that time. I prepared many of the Recitations and other small compositions, culminating in conducting the world premiere of De la Nature de la Gravite (composed in 1979 but never performed by ATEM, Aperghis’ own company in Paris) and the North American premiere of De la Nature de l’Eau in 1996, both for a large company of singers, instrumentalists and actors. Immediately obvious were the exciting dramatic possibilities and playfulness in Georges’ work as was the quality of expression, vitality and invention. By 1994, I had formed The Continuum Ensemble in London and wanted to bring Aperghis’ work to the U. K. with them. Five years later, we presented Recitations and Conversations at the South Bank Centre over three days, an entire evening was devoted to Aperghis’ smaller dramatic works. We also performed many of his concert pieces, most of which were U.K. premieres. I was extremely lucky to have Annabel Arden direct Recitations and Conversations. Grasping Georges’ meanings through his music and language (often mixtures of French, German, English, Latin and Italian) to arrive at the gesture and movement is never easy. Additionally, one must understand the significance of strong, simple design and of the theatrical and musical influences on his aesthetic. With her strong empathy for music training in Paris, work with Complicite and experience directing opera, Annabel unfailing understood Georges’ intent and rendered us all, players, actors and singers, effective beyond expectation. Georges came to see the performances and subsequently he has admired and trusted the clarity and expressiveness Annabel’s direction brings to his work. In April and May 2005 The Continuum Ensemble celebrated the music and life of one of the finest composers in the world, Henri Dutilleux, with concerts in London and Cambridge that collected all of his important ensemble and chamber music together for the first time. Now just short of his 90th birthday, Henri Dutilleux travelled from his home in Paris to attend the concert in the Purcell Room, South Bank Centre in London. We were honoured that he also agreed to speak at a pre-concert talk in conversation with Kenneth Hesketh, reflecting on his life and work. We included two world premieres by British composers who studied with Dutilleux, Kenneth Hesketh and Andrew McBirnie. Also included was the rarely heard Trois Poemes de Mallarmé by Maurice Ravel whom Dutilleux saw in Paris when he was a young composition student in Paris in the 1930’s and one of his key compositional influences. Teaming up with composer Richard Causton, The Continuum Ensemble helped organize and programme a Gamelan Music festival at the Royal College of Music London in May 2003. Richard, artistic director of the RCM Gamelan and John Pawson, music director of the RCM Gamelan, led the inaugural concert of the Royal College of Music Gamelan. The RCM purchased the new gamelan built by Pak Tentrem Sarwento in Surakarta, Eastern Java, who is among the world’s leading gamelan makers. 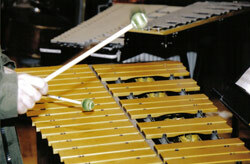 Each gamelan has its own tuning and identity and is accorded a name. This one is Gamelan Sekar Tunjung Seta which translates as White Lotus Flower Gamelan. It is a particularly large set with the deepest gong in Europe. In addition to the concert by this new gamelan there were concerts by a gamelan Degung from West Java played by students from Royal Holloway College and a gamelan Calung which is a bamboo gamelan from Central Java. The Continuum Ensemble performed a concert of music on western instruments in which all of the pieces were influenced by gamelan music. Each piece is a distillation of East and West rendered from the imaginations of the composers in which the different musical languages converge to give the full range of joyous and contemplative expression as well as distinctive sound of gamelan music. The composer JosÃ© Evangelista led a pre concert talk entitled: Debussy, McPhee, Messaien, Britten and Vivier: Composing in the 20th century with gamelan music materials. 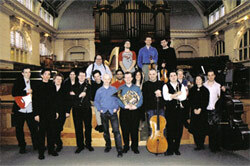 On June 24, 2003 The Continuum Ensemble repeated the concert for the Spitalfields Festival at Shoreditch Church, London, with some programme modifications. commissioned by Jan Younghusband for Channel 4 television, U.K.
Armida is a new opera specially commissioned and composed for television. Set in an occupied middle-eastern country, it is the story of Armida, a native of her country, who falls in love with Rinaldo, an officer with the peace-keeping forces. Together they set in motion a solution to the warfare that engulfs the nation and help bring an end to the violent resistance movement, led by Idraote. Filmed by the award winning director Margaret Williams and shot on location in Morocco, Armida was first broadcast across the United Kingdom on December 25, 2005 with a documentary about the production, Judith Weir: Armida and Other Stories. Sale and hire dvds of Armida and the documentary will be released soon. Douglas Finch was the artistic director for a festival devoted to the music of the composer and virtuoso pianist, Frederic Rzewski, from May 8 –17, 2006 at Blackheath Concerts Halls and Trinity College of Music in London. The Continuum Ensemble performed a concert entitled ‘Lost and Found’ with three U.K. premieres by Rzewski, music by his teacher Roger Sessions and his past collaborators, the composers Christian Wolf, Cornelius Cardew and Stephen Montague. Rzewski himself performed several piano pieces. Other events included the first ever complete performance of ‘The Road’, an eight hour sequence of piano solo music, a recital by Rzewski, performances by Ian Pace, pianist, Rivka Golani, violist, Linda Hirst, soprano and Douglas Finch, pianist as well as COMA and students of Trinity College of Music. Frederic Rzewski is a seminal figure from the radical, experimental New York scene of the 60s and Europe of the 70s. His compositions include many frequently played works for piano, dramatic works for voice, chamber and ensemble music. His performing career was no less groundbreaking in drawing together elements of improvisation, electronic music and exploration in collective music making.